This is the Papeterie’s 40th year of operation, under founder David Carruthers, left, and (since 2003) his wife, Denise Lapointe, right. The Lachine Canal was the industrial spine of Montreal during the first half of the 20th century, when it was lined with factories and filled with cargo boats. A recent wave of gentrification has transformed the canal’s disused buildings into offices, studios and condos, but there’s still at least one mill thriving on industrial-age methods and machinery. La Papeterie Saint-Armand, housed in the vast basement of a former linoleum plant, makes fine paper of endless varieties, often to order. Its handmade or machine-produced papers are made the old-fashioned way, from raw or recycled natural fibres such as cotton, flax and sisal. 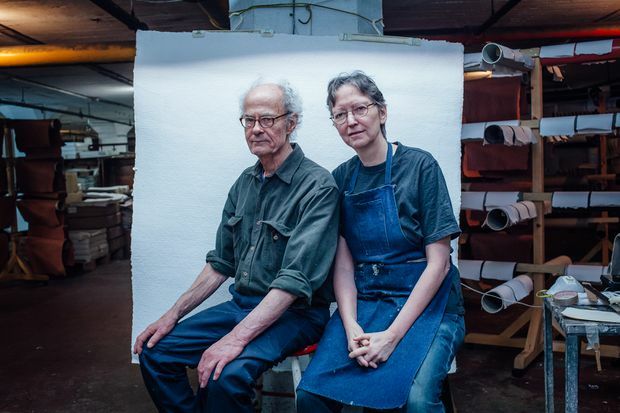 This is the Papeterie’s 40th year of operation, under founder David Carruthers and (since 2003) his wife, Denise Lapointe, but the mill’s future is threatened by shrinking access to raw materials, and the district’s upscale transformation, which will force a move within four years. The one thing not in doubt is the appeal of its products, which are in high demand among museums, fine-book publishers and visual artists. The mill is a properly Dickensian-looking workplace, with heaps of paper in various states everywhere you look, and imposing archaic machinery, some of which is virtually the same as that used in the 18th century. Huge bags of rags, scrap cotton and other material line the walls. These bags often have to be picked through by hand, to weed out synthetics and starches that can clog the machines or spoil the paper. “I wanted to follow in my father’s and grandfather’s footsteps,” Carruthers says. His grandfather opened a paper mill in 1913 in St. Catharines, Ont., where his father and uncles all worked (it’s still running, now owned by Kimberly-Clark Corp.). But they were into modern ways and mass production, while he saw potential in a low-volume, fine-quality operation. He came to it at the age of 37, after a brief academic career as an economic historian, and a decade at the Pulp and Paper Association of Canada. He got the latter job through his scholarly writings, but also on “family pull. Everybody there knew me and my family.” He wrote speeches for its charismatic president, Robert MacLaren Fowler, and assisted him at various federal commissions. The crucial raw material at the Papeterie is cotton, the sole fibre in its handmade papers and an important component in its machine-made product. Carruthers has a bricoleur’s instinct for scrounging and making do. He made his first batch of pulp in an old wringer washing machine, and built a wading pool to catch the water from his cobbled-together press. His first buyers were underwhelmed by the quality, and neighbours at his early digs protested when water from his equipment leaked onto their wooden floors. “I knew enough people in the industry to help out with advice,” he said, and he was acquainted with artists in Montreal who could tell him what paper they needed for watercolour, acrylic, etching or pastel. As he learned the craft, he sought out cast-off equipment and off-quality pulp from other mills, especially the Domtar mill at Beauharnois, Que., which made the paper for Canada’s money. “There hasn’t been a year in these 40 years when we didn’t make money,” says Carruthers, a lively 77-year-old, “partly because I’m so frugal.” His first wife got a job to help support their two children, and he spent eight years serving part-time as an alderman for Westmount. 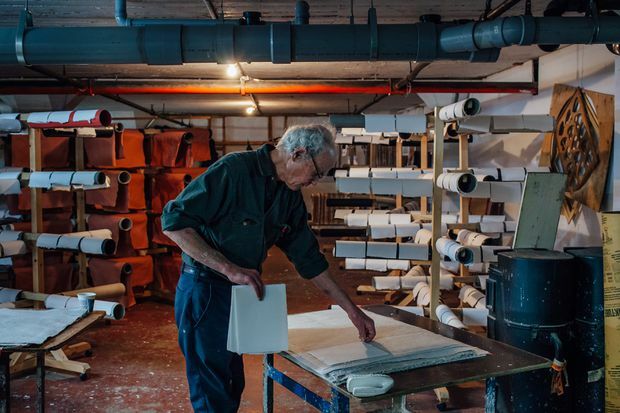 In 1992, he scaled up, moving into his present quarters and buying a sprawling 1947 Fourdrinier machine to make a multi-use paper that comes out whatever colour the rags were. The machine had to be cut into five parts to transport it from Ontario. He also bought a Hollander beater, to transform rags into relatively long-fibre pulp by passing and repassing them between narrowly aligned blades. The beater was made in 1903, and its design is virtually unchanged since the late 1600s. 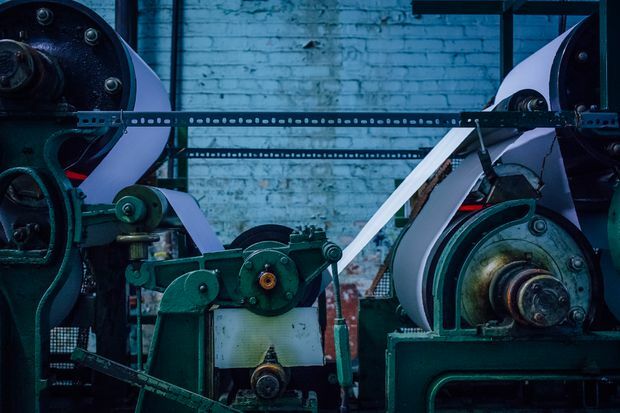 It takes up to five hours to process about 225 kilos, but the longer fibres that result give the paper more tensile strength. 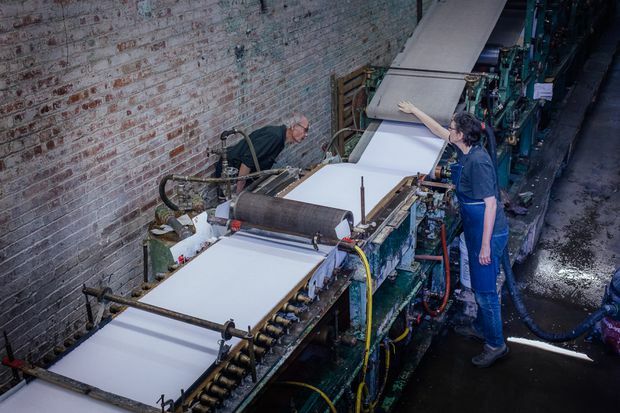 The crucial raw material at the Papeterie is cotton, the sole fibre in its handmade papers and an important component in its machine-made product. No wood pulp or bleach ever goes into Saint-Armand papers. “I’ve got it just the way I want it,” Carruthers says of his current operation, but there are big challenges ahead. He has just four suppliers of cotton rag in Montreal, and no longer gets off-quality bales from Domtar, which closed its Beauharnois plant in 2004; the government switched to plastic currency in 2011. La Papeterie Saint-Armand's products are in high demand among museums, fine-book publishers and visual artists. In 1992, Carruthers bought a 1947 Fourdrinier machine to make a multi-use paper. The sprawling machine had to be cut into five parts to transport it from Ontario. His landlord has also told him to prepare to lose his current space, within three or four years. “This building will be so yuppified by then, it’ll be unbearable,” Carruthers says, with the grin of an inveterate problem-solver. He’ll be 81 in four years, but hasn’t thought much about retiring. Lapointe, his wife and life partner, started working in the Papeterie in 1992, and married the boss in 2003. Her job, she says, is “mainly quality control.” She and Carruthers supervise a staff of four nearly full-time workers and two occasional part-timers. Many who have worked there come with an art background. Lapointe makes art books in one part of the space, in editions of 20 to 60 copies. “The text is not mine, but it’s always my design, my printing and sometimes my paper,” she says. As for Carruthers’s old contacts in the paper business, they sometimes visit, to see how it all used to be done. “They love this mill,” he said. “It’s like their pet.” There’s a kind of romance and tactility at the Papeterie that doesn’t exist at a big automated mill. And where else are you going to find someone who will make you a custom paper with apple leaves pressed into it, or photo-album pages that are black because they were made from black jean rags?